and I just can’t hide it, I’m about to lose control. So, I’m driving home this evening from the college listening to the “Comin’ On Strong” album by Carman. You’ve more than likely never heard of him, but I grew up listening to him. Anyway, listening to this “blast from the past” started me thinking about a blog Los wrote last week asking what we wanted to be when we grew up. When I read his question all I could remember was that I wanted to be a teacher when I grew up, and I am. However, singing along to Blessed Is He Who Comes, I remembered wanting to be a back-up singer for Carman. I never wanted to be the one that everyone saw, but I wanted to sing. That got me thinking about what I do on Sunday’s. I get to sing every Sunday with Eddie, who is an awesome musician, and I get to work with first through sixth graders and show them how much fun it can be to worship God and that it’s not just about singing a song. How incredibly awesome is that? Then that brought me to the thought that I really can’t imagine being anywhere else in my life. God is AMAZING and has worked things out way better than I ever could have. So that started me thinking about exactly where I am in my life and what I thought (when I was a kid) I would be doing at this point in my life and how it differs, one of those being that I’m still happily single (ok, well maybe not COMPLETELY happy, but pretty happy). Which got me thinking about this guy that I’m attracted to but do not want to date and I’ve been wondering why I don’t want to date him. I mean, he’s a pretty great guy, lots of great qualities. And it hit me, we are way too similar. I need someone that’s going to balance me out and that is not him. So, now I’m home, typing my thoughts, and feeling euphoric about all these little break-through’s I’ve had this evening. Yea for Diana! If you ignore me in the back isn't this a cute picture? 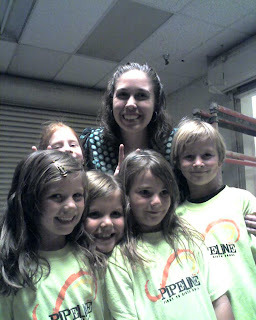 I love my motions team kids, they're awesome and they bring a smile to my face every Sunday. 1) I am OCD, I have to do almost everything in sets of two. I literally can not have just one chip, I have to have two. 2) I will purposefully sing off key when by myself so that I know how horrible I can sound. 3) I don't like diamonds. 4) Medicine tends to react oppositely of the way it should with me. For example, benadryl hypes me up and my inhaler makes me sleep. 5) I am a Christian AND teach physics, not a common combination. 6) I love to act like a little kid but rarely do for fear of being judged. 7) If something scares me I will do it just because it does scare me. 8) I hate talking on the phone. Now, who to tag??? I'll tag Grace and Sam. Well, I went to emergency yesterday evening and got home about 1 this morning. My cyst broke, although I'm not exactly sure when, probably last weekend. Got a shot of morphine, got a CT scan, then they discharged me. I'm still in a little bit of pain, but nothing like I have been. 1) The doctor telling the patient in the bed next to me, "We'll leave no stone unturned," after telling him he probably had kidney stones. 2) Clint asking the nurse/doctor, "Can we use the paddles on her, I want to see her jump." 3) Clint saying, "I'm sterile now!" after washing his hands. There were many more things that made me laugh, but I can't remember them all right now. Thank you to Clint, Sam, Mom, Carle, Steven, and Bailey for keeping it light-hearted while they tried to find the problem. You all are awesome. Thank you to everyone who has been praying for me, I greatly appreciate it.